This heroic helicopter pilot was on his way back to the airfield after fighting another fire when he spotted the column of smoke. Firetrucks were not on the way and he was first on the scene. 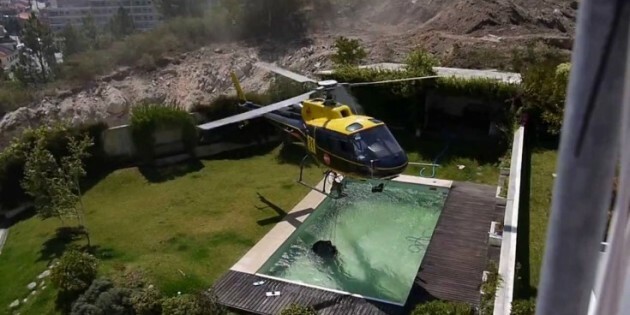 He decided to take the added risk of collecting water from a neighbors pool since the water source was so close and he was worried that the fire might creep into the neighborhood. He did about 25 trips and had the fire out by the time the fire trucks arrived. I think this is a cool video and shows the skills and risks these men make daily! I NEVER KNEW CHOPPERS COULD MOVE THIS WAY! That's heroic and saved houses. Thats preet cool good job buddy kudos to you. Wow … it hardly seems as if that would be enough water to do any good! Hope it did, though!